LAST June, at the Public Vaccination Station at Norwich, nine children were vaccinated by the Public Vaccinator, and in less than three weeks four of them were dead, and the remaining five were labouring under more or less severe constitutional disease. Many other children vaccinated about the same time were entirely unaffected, so far as their health was concerned, by the operation. Thanks chiefly to the untiring zeal of Mr. Bliss, aided by Mr. Burgess, and the persistency of Mr. Peter A. Taylor, M.P., a public inquiry into the cause of the outbreak was held last August, and thanks to the impartiality of the Inspectors, Mr. Henley and Dr. Airy, and the able advocacy of Mr. Corrie Grant, and in spite of the Local Government Board, the whole of the facts concerning these very painful cases has been put in the possession of the public. To-night it is proposed to discuss the evidence which was deposed at the inquiry, the not very satisfactory report of the Inspectors, and the remarkable memorandum which Dr. Buchanan has deemed it necessary to add. It is needless to say the subject must be approached impartially, for however much the painful circumstances may excite our indignation and command our sympathy, we must, nevertheless, if we would attempt to unravel the cause of this disaster, set to work in a scientific spirit. We must not be too prone to accept all evidence against vaccination without sifting it, for that is the surest way of ruining any cause which we represent; and, on the other hand, we must not begin by assuming, as it would seem the Inspectors assumed in their report, that the uncontaminated vaccine lymph of a healthy child must be innocuous. That assumption, which is so often made, amounts to nothing less than begging the whole question. Vaccination with pure lymph, they say, cannot possibly do any harm, and then proceed to argue that because in such and such cases evil did result, ergo, the lymph must have been impure; entirely failing to see that that lymph, the impurity of which can only be tested by its results, is no better than lymph which is confessedly impure. When the child is dead of erysipelas it is too late to discover that the virus used was impure, and a retrospective test of the purity of lymph is worse than no test at all. The leading facts of the several cases may be told in a few words, and the accompanying tables show the chief points at a glance. 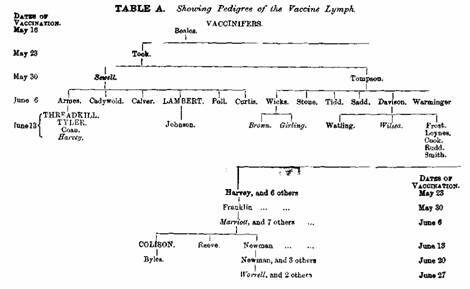 Table A gives the pedigree of the lymph as conveyed from one generation of vaccinifers to another. The names of those children who suffered, but recovered, are printed in italics ; and of those who died, in capitals. In the last column the weekly dates of the vaccination are given. Table B furnishes the leading factsconcerning each of the cases. Such then, are briefly the facts concerning the children who were seriously or fatally injured through vaccination at Norwich. It is now our business to inquire into the several possible explanations which may be given of the outbreak, to attempt to indicate the true one, and to ascertain how far the precautions which are, or are to be, adopted, are adequate to the prevention of similar out�breaks in the future. For, if it should once be proved that the occurrence of erysipelas, &c., after vaccination is due to some inherent condition of the lymph, or some unavoidable danger in the operation, or unless the cause of the disease in these cases can be clearly indicated and promptly obviated in the future, I venture to submit that on this ground alone the law is not justified in compelling obedience from those who prefer the not-inevitable risk of smallpox to the not-unavoidable risk of erysipelas. The explanation afforded by the two inspectors after the examination of thirty-seven witnesses, one month's private inquiry by Dr. Airy, and two months' mature deliberation, must have been as unsatisfactory to them as it was to all interested in the inquiry; for they sum up their conclusion thus :�"We can only conclude that the outbreak was due to some contamination of the lymph which has escaped detection"! Neither is the hypothesis vouchsafed by Dr. Buchanan such as is at all warranted by the evidence deposed at the inquiry; and if Dr. Buchanan had seen with his eyes instead of his ears, and inspected the children at Norwich, instead of romancing from hearsay at Whitehall, he would have reflected more credit upon the Department over which he presides and upon his own reputation. What then are all the possible explanations which might be put forward to account for the disease and death which followed so closely on the vaccination of these children! These were ably summarised by Mr. Corrie Grant in his closing speech, and the contention there put forward, which represented my opinion then, having read the report of the Inspectors, represents my opinion still. I. It might be suggested in the first place that it was not the fault of the vaccination at all, but that the children were themselves unhealthy, and that the simplest scratch made in their skins would have resulted in similarly disastrous consequences. Now, such a theory, which might be, and no doubt is, employed to explain isolated cases of the kind with which we are .dealing, is rendered a priori untenable by the very number of the victims, apart from the gross indiscretion it would display on the part of an experienced vaccinator like Dr. Guy, for operating at once on so many children who were so manifestly unfit for vaccination. It is sufficient, however, to point out that conclusive evidence was given in every case as to the health of the children previous to their vaccination. II. It might be suggested that superadded disease had been conveyed from the vaccinifers to those vaccinated, but here we are at once met by the fact that no less than six different vaccinifers were employed to furnish lymph for the nine vaccinated, and that at least four of the vaccinifers, prior and subsequently to vaccination, had been entirely free from disease of any kind, and the Inspectors added, "no blame is cast upon the vaccinator in respect of the selection of any of the vaccinifers." III. Then, again, it has been hinted that the outbreak was due to some ill-defined meteorological or epidemical constitution of the atmosphere.
" On June 13 last, I believe erysipelas was epidemic in Norwich; I heard this since that date. I believe Mr. Lyddon told me; he said he had a case of erysipelas. Dr. Airy told me last Friday week there were cases of erysipelas; I have also heard of isolated cases. From what I heard, I considered there were two or three cases m Norwich at the end of June. I believe there was a slight epidemic of erysipelas." This was the whole of the evidence given to support this theory, while against it Mr. Lyddon deposed that in the month of June he thought there were about half-a-dozen cases dotted about Norwich. Mr. Richardson denied that there had been anything that could be described as an epidemic of erysipelas in Norwich, while Mr. Crook had not seen a case in his practice since February. Dr. Guy, when hard pushed for a theory, was driven to take refuge in the hot weather, as an explanation of the post-vaccinal erysipelas. A meteorological chart was forthwith put in by Mr. Bennett, which showed that on the fatal day, June 13, the lowest readings, both maximum and minimum, for the whole of the month, were recorded. IV. Suggestions were also made in the course of the inquiry as to the possibility of insanitary conditions at the homes of the children occasioning the erysipelas. Such a possibility was rendered highly improbable by the fact that the children came from divers parts of Norwich, disproved in all but one of the cases by positive evidence as to the cleanliness of the homes of the parents of the children. V. Next we come to the very important matter of the mode of vaccination; some error or want of care in the performance of which, and not the vaccination itself, it has been strongly urged, is mainly responsible for the Norwich disasters; and undur this heading will come the consideration of Dr. Buchanan's theory of the "ivory points." Now it is on this very point that Dr. Airy and Mr. Henley are entirely opposed to Dr. Buchanan, who has mercilessly tried to make Dr. Guy and his dirty ivory points the scapegoat for the whole affair. "With regard to the mode in which the public vaccinator had performed his public duties, no charge was brought against him by the complainants, nor did it appear, in spite of confused admis�ions on his part, under a very severe examination by the counsel engaged on behalf of the complainants, that he had failed in care�fulness or skill in the performance of his duty." "We find that no blame was proved to attach to the public vaccinator as regards the performance of his duties at the station, or to the appliances at the station itself. We do not regard the state of the irory points as the probable cause of the mischief." It is true that Dr. Guy admitted in cross-examination that he did not comply specifically with the instructions of the Local Government Board; but this state of things is in no way peculiar to Norwich, and, in fact, it is a sheer impossibility to carry these instructions out fully in the hurry and routine of a public vaccination station, and simply shows the utter impracticability and injustice of a system which is not considered safe, except under precautions which it is perfectly impossible to adopt. Notwithstanding the disavowal of the inspectors respecting the ivory points, and their exoneration of Dr. Guy, and notwithstanding the fact that there was not one tittle of evidence given to indicate the ivory points as the fons et origo mali, Dr. Buchanan undertakes the thankless task of whitewashing vaccination at Dr. Guy's expense, and undertakes to clear up the whole mystery on the assumption that foul ivory points were used. "I do not use the same points more than once on same day; when a point is once used I put it into a saucer; after use I put a point into water and rub it on a towel, then rub it on emery paper, then put it into water and rub it on a towel again, and before using it again, I put it into water and wipe it on a towel." "All that is required to account for occurrences that had previously been unintelligible, is to believe that in the middle of the sitting on June 13 a group of imperfectly cleaned ivory points came into use; that two of these were used to take lymph from Percy Armes, and were rubbed into the punctures on Threadkill and Tyler; that a third was used to take lymph from Lambert, and was rubbed into Lambert's arm, and a fourth to take lymph from Wicks to Girling, and was rubbed into the punctures on Girling's arm. This is literally all that is needful to account for the whole of the peculiarly obscure occurrences of June 13." Now, at best, this theory only professes to explain four of the cases, and entirely ignores the remaining five. It also shows, as pointed out by Mr. Bliss in a letter to the Times, that Dr. Buchanan has forgotten that, besides these cases of Dr. Guy's, there were three others�two of death and one of injury�occurring in the private practice of other medical men, and into which the Inspectors were not instructed to inquire. Then, again, if Dr. Buchanan had carefully tested his theory by appealing to facts, or even by examining the children, which I had the advantage of doing�an advantage which might possibly have warped Dr Buchanan's judgment---he would have seen that it was as reckless to ascribe the Norwich cases to septic ivory points as it was of Dr. Radcliffe to dismiss the Gainsborough cases as explained by a peculiar local tendency to the spread of erysipelas in the neighbourhood. In dealing with this subject it is important to bear in mind the extent of the interval which elapsed in the several cases between vaccination and the appearance of the disease. Now, what Dr. Buchanan asserts is this, viz., that the infection of the erysipelas took place at the time of the application of the points to the arm, either in the process of vaccination or in the process of taking lymph on the eighth day. Of the nine cases, four�viz., Threadkill, Tyler (Harvey) and Girling�were, according to Dr. Buchanan's theory, infected at the time of vaccination, whereas Lambert, Colison, Brown, Wilsea, and Worrell were infected on the day of inspection. In reply, one is driven to inquire, if supposing such explanation to hold, how came it that Threadkill, Tyler, and Harvey were infected at the time of their vaccination, while Percy Armes, to whose arm these suspected points were first and most frequently applied, was not infected thereby? And why, again, should Lambert have been inoculated while taking lymph from her arm, whereas the only child, Johnson, for whose vaccination these fatal points were em�ployed, escaped with impunity? It is difficult to see how that foul points should in the one case kill two out of four children vaccinated from a vaccinifer who took no harm, while in the other case they killed the vaccinifer while the child vaccinated from her escaped intact. "I took the child to Dr. Guy's the day after inspection I said, �You did not take anything from the arm yesterday, and I suppose this is the result.'" And Dr Guy also stated that he took no lymph from the arm, as the vesicles were too forward. And again, in Worrell's case, which was attributable, as Dr. Buchanan has it, to the date of inspection, Dr. Guy deposed, "I took no lymph from its arm." So that here, again, infection by ivory points is out of the question. Once more, in Girling's case, how came it that she should be infected at her vacci�nation, while the vaccinifer, Wicks, was uncontaminated? Lastly, it is abundantly proved that in similar cases, where no septic ivory points have been used, erysipelas, sometimes fatal, has followed vaccination. VI. In conclusion, I will consider the hypothesis that the cause of all the phenomena resided in the vaccine lymph itself; and here let me call attention to the fact that erysipelas after vaccination is not extremely rare. The accompanying table gives the deaths thus registered since 1859, and when it is borne in mind that all such cases are not returned as such, in order, according to Mr. May, " to save vaccination from reproach;" that not one of the cases at Gainsborough, and only one of the cases at Norwich were certified thus, it will be seen that these figures only represent a portion of the whole truth. So long ago as 1806, the College of Surgeons published 24 cases of inflammation of the arm following vaccination, whereof three proved fatal. In 1844 the Dublin Journal of Medical Science published a series of cases of erysipelas after vaccination. In 1849-50, Dr. J. Jones, of Boston, reported that erysipelas frequently followed vaccination. In 1871 a great number of cases occurred in London. In 1876, a series of eighteen cases, of which eight proved fatal, were disclosed at Gainsborough, and were the subject of a Local Government Board inquiry by Dr. Netten Radcliffe. In 1878, Dr. Martin, of Boston, wrote of erysipelas, "that miserable complication, the pest of vaccinators." Enough has been said to show that erysipelas does not unfrequently follow vaccination, in different places and countries, and under divers conditions; that there is some connection between the two factors apart from surroundings and accident, and that the greatest and most remarkable peculiarity of all, in the Norwich cases, is, that they should have obtained such wide recognition and publicity. Even at Norwich, such occurrences are not all exceptional. "I have seen vaccine cases which have run on quickly, and produced erysipelatous inflammation in the course of three or four days. I have met several of these cases in the course of my ex�perience; in those cases the infiammation spread from the crease of the neck to the elbow, and affected the glands in the axilla, and sometimes the vaccine sores have ran to ulceration." "I repeatedly have cases of erythema after vaccination in my awn practice, but not so severe as this. It occurs about the same period after vaccination, to the twelfth or fourteenth day. I have also had cases of vesicles turning to open sores and discharging matter. I consider this is one of the results which may be expected from vaccination, but it is not usual." "I have been consulted by women with vaccinated children in about nine or ten cases from the city in the last twelve months. Generally they were bad cases of erysipelas." And, indeed, these are not the first cases of the kind that have occurred in Dr. Guy's practice as public vaccinator; for in December, 1877, Mr. Burgess made a complaint to the Guardians against that gentleman, giving notes of a series of cases of illness following vaccination. In the course of a systematic visitation of the vaccinated and vaccinifers, I discovered three other cases of rash following vaccination, two of which had even escaped the vigilance of Dr. Airy himself�viz., the cases of Howse and Davie. I think, then, we may safely assert, in the first place, that erysipelas and other skin diseases, as eczema and prurigo, are not, and never have been, very uncommon sequela or complications of vaccination. What, I would next ask, do we know of erysipelas, and what of the nature of vaccine lymph and its modus operandi? We know that vaccinia is an inoculable disease; that its materies morbi is in some way connected with the solid particles it contains, as proved by Drs. Burden Sanderson ("Public Health Reports"), Lionel Beale, and Chauveau; and that these solid particles are minute spheroidal bodies, known by the very formidable name of micrococci. Of erysipelas we know, too, that it is a disease which can be propagated by inoculation, yet which also can originate de novo in any putrid sore. We know, too, that, as with vaccine lymph, so with erysipelas, micrococci are the cause, or stand in some relation to the cause, of the disease. I may quote from the "Public Health Reports," New Series, No. 3, wherein it is stated that "Septic material containing micrococci, when applied to a wound, produces intense local inflammation, which rapidly affects the surrounding skin; the spreading disease thus produced corresponds in all its phenomena with erysipelas." If for "septic material containing micrococci" we substitute the legitimately inter�changeable term "vaccine lymph," it would be difficult even for Dr. Buchanan to escape from the conclusion that the erysipelatous poison is inherent in the vaccine lymph. And here, strange enough we have the illustrious corroboration of Dr. Jenner's own testimony, for if there was anything Jenner insisted upon it was this�that erysipelas is a necessary accompaniment of true cow-pox�in fact, the seal of authenticity. Indeed, when hard pressed for pure lymph, he confesses he resorted with the utmost indifference to an "extensive inflammation of an erysipelatous character in the upper part of the thigh of a sucking-colt" for a supply; and he added, that the lymph thus obtained was the true, and not the spurious, cowpox, was beyond contention. With regard to the cases in which diseases other than erysipelas followed vaccination, as in Harvey, Sewell, Davie, and Howse, I may say that Mr. Hutchinson has published many such, and in his clinical lectures he observes that "various forms of eruption do occur as the direct results of vaccination, and that a vesicular one is the most common; indeed, the wonder is not that vaccination should sometimes produce an exanthem, but that it should ever be without one." Now to apply these facts we have learnt to the cases under investigation. And I would first of all observe that we see in these cases different degrees of gravity, extending from those in which no harm resulted, through those, like Marriott and Girling, where erysipelas was local and tolerably circumscribed, on to the cases of Threadkill and Tyler, which were examples of the acutest septic poisoning; and, side by side with these cases, we find also certain bye-results, as it were: aberrant forms in which, as in Wilsea, pyaemia resulted; in Harvey, eczema; and in Howse, Davie, and Sewell, prurigo. That vaccination pure and simple can, per se, originate and convey erysipelas I have not the smallest doubt; and if the Inspectors had followed the evidence here, instead of their preconceived ideas, they would have come to the same conclusion. "I should not attribute the erythema to any special fault in the vaccine lymph. I do not consider by any examination of vaccine lymph it could be ascertained whether it was likely to produce such results. I am speaking of pure lymph. Lymph which appears to be perfectly pure, or which is pure, may produce erythema. There are no medical tests, to my knowledge, by which it can be told whether the lymph is likely to cause erythema. Pure lymph taken from a child perfectly healthy, to all appearance, might produce erythema. In my opinion, the only way to judge whether lymph is pure or not is by its results as to erythema. The result is the only guide. That answer would apply to other diseases besides erythema. If the subject of vaccination and the vaccinifer were healthy and the lymph pure, erythema and other diseases might still follow vaccination, but the diseases would be intensified by unhealthiness in either child." "In my opinion, the erysipelatous appearance arose from no blame either in the vaccinator or in the vaccinifer; vaccination is often irregular in its course; sometimes it goes on very quickly, other times tardily." "In my opinion, the purity of lymph can only be tested by results. I agree with Mr. Lyddon that, assuming a healthy child to be carefully vaccinated with pure lymph, erysipelas might follow. Unfortunately, I can recall cases in my practice." So that, as far as the evidence went, it was established that pure lymph, taken from a healthy child, and inoculated upon another perfectly healthy child, might determine even fatal erysipelas; that purity of lymph is only known by its results; that the only test is a pathological one ; and that impure lymph is but too often an invention employed to explain away disasters. "An opinion was put forward at the inquiry, that pure lymph taken from a healthy child and inserted in the arm of another healthy child might of itself cause erysipelas in the latter. We cannot entertain this opinion, in view of the habitual absence of erysipelas from the practice of vaccination. We conceive that if this opinion were well grounded, erysipelas would habitually show itself in a sporadic manner at a station so largely frequented as that of Norwich. But the outburst of erysipelas with which we are concerned displays an epidemic and exceptional character which plainly negatives any theory that would make it depend upon the habitual operation of an ever-present cause." But Jenner was right in a sense in affirming, and the Inspectors are wrong in a sense in denying, that erysipelas is a very frequent, if not invariable, accompaniment and result of vaccination. Jenner, when he said erysipelas, meant the areola which usually surrounds vaccine vesicles on the eighth to the fourteenth or fifteenth day ; the areola is erysipelas, different from our usual conception of the latter, not in kind, only in degree, and apt, under favourable circumstances, to become worthy of the name. I may quote here the opinion of Dr. Ogston on this point, to corroborate my own. He says (Journal of Anat. and Phys., October, 1882) :�" There is in reality no distinction between the erysipelatous blush surrounding an acute abscess in its earliest stage, the erysipelatous infiltration that is common around the wounds of the septicaemic, and the phlegmonous erysipelas that is so often fatal from blood-poisoning." And again:�"Between the simple localised acute inflammation on the one hand, and the severest case of pyaemia, there exists only a difference in degree, a difference in intensity." In assuming that erysipelas is inherent in every septic fluid like vaccine lymph, and regarding the whole system of arm-to-arm vaccination as a huge Pasteurian method of cultivating and attenuating diseases at will, we need not be surprised that the erysipelatous blush or areola which normally accompanies true cow-pox vesicles, should in some cases extend indefinitely and even extensively, and occasionally lead to a fatal issue. The only fact yet remaining unaccounted for�and I frankly admit it ought to be accounted for�is, why does the erysipelas extend in some cases, and why does it remain circumscribed and local in the great majority, as un�doubtedly it does? Here we tread upon hypothetical ground, and I can do no more than suggest that, presuming no unhealthiness either in vaccinifer or vaccinated, as in these cases, it may be due to the largeness or smallness of the dose of the septic poison, perhaps to the number of micrococci which are absorbed. In support of this theory, I may again quote Dr. Ogston, who says:�"The number of micrococci in the general circulation are in proportion to the severity of the disease; so, also, the number of micrococci in the pus are in proportion to the virulence and intensity of the inflammation." And again, Dr. Burdon Sanderson, who says ("Public Health Report," New Series, No. vi., p. 68):�"The relation of intensity between different cases of septicaemia and pysemic infection is indicated by the number and character of these organisms." In conclusion, I may summarise the theory I put forward thus : That vaccine lymph is a septic fluid containing micrococci, and, as such, is capable, per se, of causing erysipelas by inoculation, and that, in fact, the normal vaccine areola is a local and mild erysipelas; that under certain conditions, possibly the result of cultivation from arm to arm, and possibly by the lymph being richer than usual in the number of septic particles, the erysipelas becomes diffuse, and perhaps fatal, that the vaccine pustules may, like any other putrid sore, originate erysipelas de novo; that in vaccination we use an animal poison whose mode of action is unknown to us, and whose effects we cannot measure; that the purity of the lymph can only be ascertained by its results; and that no amount of care or caution can obviate a repetition of other disasters like that which has recently shocked us at Norwich. Such being the case, it is at once the grossest tyranny to continue the compulsory enforce�ment of vaccination, and the supremest folly to think, with Dr. Buchanan, that the only lesson to be learnt from the Norwich inquiry is this�" Never use an ivory point a second time!" Of the protective power of vaccination I say nothing to-night If that be so overwhelming as to render such misfortunes as these infinitesimal, compulsion itself could not be a stronger argument for its adoption; but if, on the other hand, we have to deal, as the Home Secretary declares, with a balance of advantages, a choice of evils, an alternative of risks, is it too much to ask that a parent shall have the right to choose for himself and his child?